Colin Barson (OxVox Chairman), Paul Peros (Vice Chairman), and other committee members; invited guests Zaki Nuseibah (OUFC Director and Shareholder), Niall McWilliams (OUFC Managing Director), Jon Rycroft (Oxford University Sports Ground Maintenance), Jerome Sale (BBC Oxford), Jack Thompson (Oxford Mail); and approximately 45 Trust members. Colin Barson (CB) began by introducing the guests, and new OxVox committee members, welcoming everyone, and giving a brief overview of recent OxVox activities. He explained that the bulk of the meeting tonight was intended to give members the opportunity to question the Trust and the Club in an open forum style. Niall McWilliams (NMcW) and Zaki Nuseibah (ZN) would respond to members’ questions on any aspect of the club’s activities apart from directly football-related matters. Jon Rycroft would address any questions on the management of the Kassam Stadium pitch. Apologies had been received from County Council leader Ian Hudspeth and Trust committee members Michael North, Wesley Harrison, and Jemma Hayward, as well as from several Trust members. CB reported that Trust membership stood at 1,020 compared with 955 a year ago. The largest growth had been in the number of life members, up from 208 to 265, and the Trust encouraged existing members to upgrade to life membership to save money and to ease administration. Upgrading could be done at any time by contacting the Trust, even if your current membership is not due to expire. Financially, the Trust held £12,138 in its accounts as of 28 September 2018, slightly up on the same period last year. This was after the main spending item in the year, the sensory room equipment at £1,691. The Trust’s financial year end is 30 September and we anticipate the audited accounts being complete sometime around the end of the calendar year, which is considerably inside the required date by Companies House. The Sensory Room had been instigated by the ladies of Jigsaw Oxford (see https://www.facebook.com/JigsawOxford/ ) and provided a safe space at the stadium before and during home matches for children and young people on the autistic spectrum. OxVox’s role had been to source and fund equipment for the room and to work with Jigsaw to facilitate the project with the assistance of the Club and Firoka: committee members Ali Wolfe, Dave Thornton and Paul Peros had been those directly involved. The mounting of a Blue Plaque outside the Britannia pub to commemorate the meeting which 125 years ago established the Club was still a project in progress. The Blue Plaque Society has agreed in principle to the request, as has the brewery (from whom we are awaiting written confirmation), and the allocation of plaques annually is limited and we will have to wait our turn. The cost will be £800 to be paid, by OxVox, in due course. Meanwhile, a framed picture which is believed to be the earliest Headington United team photograph in existence was presented to the pub on the 125th anniversary and is now mounted behind the bar. Images had been selected and copyright permissions sought for the proposed East Stand Mural, reported Simon Hathaway. Costs quoted for the original design had been higher than anticipated and alternatives were being examined. We may review our funding options for this project, pending the result of this. The Trust now had a permanent member sitting on the Club’s Safety Advisory Group(which manages match day safety) in Dave Thornton. OxVox had supported Ian Mixter and the Club in establishing the OxRails project, which was intended to expand across the East Stand to cover the back ten rows of seats, and has been in touch with local MPs Layla Moran and Anneliese Dodds who are in support of safe standing options at football. 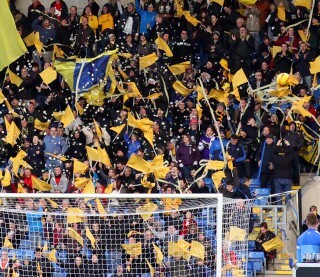 The Trust’s registration of the Kassam Stadium as an Asset of Community Value (ACV) was renewed in July for a further period of five years [NB Not 3 years as stated at the meeting]. This is regarded as an important step and the renewal was not challenged by Firoka, as the initial listing had been in 2013. Other matters on which the Trust has had dialogue with the Club and stadium company during the year include defibrillator provision, seat and toilet cleaning, and seasonticket prices. The meeting was then thrown open for questions to the Trust and the Club guests. Questions and responses are recorded below in the approximate order asked, as near to verbatim as practical, and grouped together where very similar questions were asked. Mark Sargeant: What’s the situation with HMRC? Paul Beasley: How much is owed and can we pay it? ZN confirmed that it was an error which should not have happened. The Club was dealing with it and steps were being taken to ensure that it did not happen again in future. The amount was not given but ZN said that it would be dealt with this week. He added that processes were being put in place to prevent the situation recurring in the future. Mark Sargeant: A Shareholders’ AGM was promised in 2018, when will it happen? NMcW replied that this was a fair question and an unfortunate oversight. He and ZN would discuss with Tiger and confirm as soon as possible that there would be an AGM for the next financial year. He apologised for the oversight this year. Simon Bradbury: Can you provide an update on the arbitration issue with Firoka? ZN had held a positive initial meeting with Firoz Kassam. He hoped to establish a professional and proactive dialogue with him. This should enable resolution of a number of petty issues affecting the Club, and enable progress on matters such as the introduction of Singha beer at the ground. The ending of the arbitration dispute as soon as possible was part of the process. ZN remarked that, even if the club pursued a new stadium location, we were at the Kassam Stadium for the immediate future and it was in everybody’s best interests to work more efficiently with Firoka. A member asked: Is this focus on the Kassam Stadium in conflict with talk of new stadium sites? Are there mixed messages? No, replied NMcW, there is no contradiction, it’s a matter of short term versus long term planning. ZN agreed. Tony Wright: Can the Board communicate more with the fans? Mark Sargeant: Can you let us know when things are happening with regular updates e.g. Ask Ashton? ZN replied yes, when there is something substantial to say. Fans would have to appreciate that some things are confidential. NMcW acknowledged the need to be more open on what is happening on non-football matters, where possible. He thought a regular live radio slot (similar to Ask Ashton) had some merit, but that a weekly update would possibly be too often. A member asked: What is the role of the new board members e.g. Erick Thohir? ZN replied that their roles would certainly be beyond advisory, but did not give specific details. The Board now had members from, and with experience in, the Middle East, Asia, Europe and the US and were, said ZN, a diverse group of successful individuals forming a strong Board to support Tiger. He felt the Club’s potential was huge and that it was a board that is as strong as any at our level. Furthermore, he expanded that, aside from the board, the work ethic of the Club’s employees was excellent as were the facilities at the training ground. Peter from Abingdon asked: What are the Board’s shareholdings? ZN replied that Tiger remained the majority shareholder. NMcW undertook to provide exact detail on shareholdings, in the Singapore based holding company, shortly. This information is available though, as a matter of public record, at both Companies House in the UK and its Singapore equivalent. Tim (surname not noted) asked: What about a 4th stand? ZN said that developments at the open end would be discussed with Firoz Kassam. A proposal, for a large full width screen, made to the club by CB is under consideration. BothZN and NMcW agreed that a 4th stand would be needed in the Championship and the ambition is to get there. The vision and responsibility of the Board is to establish OUFC as a sustainable Championship club. We are fortunate to be in a county with 700K+ population and only one professional football club, so the potential is recognised. The building blocks of a detailed process to achieve the ambition are being put in place. Sustainability would include developing and selling on exceptional young talent. Hayley from Jigsaw asked: Can a changing facility for users of the sensory room be arranged? NMcW undertook to take this up with Firoka. Paul Beasley: How much can be done on the car park on match days (fanzones) – would there be extra costs payable to Firoka? Fanzones will be considered, as would any potential costs. A forum will be held at the new training ground when work is completed. Travelling forums around the county will be set up from February, said NMcW. NMcW thought criticism of the marketing effort was very unfair given we had the most successful shirt sales ever and other areas were performing very well under the new management. The club was open to suggestions on merchandise. There was no specific comment on the senior age limit. Out of date match posters at the Covered Market shop would be addressed. Trevor Lambert: Could club merchandise outlets be set up in the concourses, for some games? NMcW undertook to look at this for the Christmas fixtures. A member asked about a contract decision on Nile Ranger, and the potential for squad strengthening in January. ZN responded that, as for any potential signing, the ultimate decision about a proposed contract for Nile Ranger would be the Board’s. We would always be looking to strengthen. Mark Sargeant: Could fans be advised when the mobile fence behind the North Stand is to be used? NMcW would look at publicising this on match days, via the PA or other means. A member asked about restaurant availability for future matches. The restaurant was well received by users, but the economics were tight and the Club needed to review when it is viable. NMcW would communicate plans to fans as soon as possible. Mark Sargeant asked about the situation with sports science at the Club, given the number of injuries. Chris Short was viewed by the Club as one of the highest qualified individuals in the country in this area, and Amy Cranston was an excellent physio. A number of recent injuries had been impact injuries and as such were unlucky. Mark Sargeant asked about the Club’s view of the Checkatrade Trophy, given attendances and interest in the early rounds are small. NMcW was very supportive of the competition, which had attractive prize money and brought in additional revenue. The Club wants to win it, as it does every competition it enters. The format may change next season. NMcW agreed there was scope for more detailed information to fans and agreed that the Club should improve in this respect. He would consider this suggestion and respond. Simon Hathaway thanked ZN and NMcW for their support for the Yellow Army walk. Both replied that they were glad to help. On the pitch, Jon Rycroft commented that the pitch specification was not as expected and it had not been maintained fully, making the University’s short term maintenance contract harder to follow through. He commented that the Club should have more information on the pitch setup. Edit: Since the meeting Jon has informed OxVox that the University has not been retained by the stadium company beyond its current short-term contract. We do not at this stage know who has replaced them. That completes the report of the Q&A to the Club representatives. OxVox have forwarded to NMcW a list of questions and action points from the meeting. Further to this, we have included further questions regarding the financial situation at the club, that were not asked on the night. We are also writing to the Directors and major Shareholders and we will report back to members when we can. CB asked whether there were any questions specifically for OxVox. Members present confirmed that they were successfully receiving Trust emails.